This entry was posted in Web links on June 23, 2004 by Links. For the past 20 years I have recorded EVERY television commercial on CBS, 24 hours a day, 365 days a year. From Sony to Salad Shooter from Pontiac to Prego, I’ve captured them all! Each day at midnight I let a tape record for 6 hours, insert a new tape for recording, and repeat twice more. After that, on my other VCR’s I edit out all the shows which yields roughly 6 hours and 24 minutes of commercials daily. I now have 46,720 hours of commercials stored on 7,787 VHS tapes. But I have grown old and weary and would like to leave this legacy of tapes to someone with an equal passion for television commercials who wants to continue the work. Please write to me and let me know why my collection would mean the world to you. Be very specific! The person who shows me the greatest interest will carry on the project. This entry was posted in Web links on June 7, 2004 by Links. A weird thing happened today. As I was driving and leaving my housing division, a bird hit my car. There were two birds and they flew from the trees on the right hand of the road to the middle of the road. Perhaps they spotted a worm. I approached them and I figured that they would fly off. Unfortunately, they chose to retrace their flight which my truck happened to drive into. Sigh. I had a feeling they would flee in that direction. I should have drove on the other side of the road. This is a first for me. So far, I have run over a squirrel and a couple of cats. I feel bad about killing them and wish I would have seen them in time to avoid hitting them. But it is a hard fact of destroying the environment, err, driving a car. I have also had a near miss from some deers (which will definitely do some damage). Of course, I don’t count the millions of insects that I have killed. This time I did not see the bird at all except for a brief glimpse from my peripheral vision and a loud thud from outside (my windows were rolled down). This time I stopped and looked for the bird but did not see anything. While I was checking my truck for damage a cop stopped and asked me if there was anything wrong. I responded that I was struck by a bird! Should I start taking another exit from the complex? 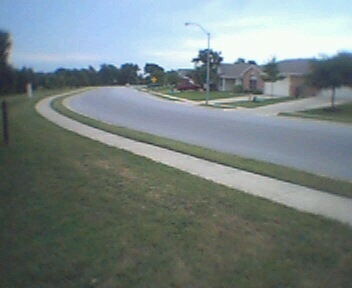 This entry was posted in Phone post on June 5, 2004 by Mark. Its another UFO! Not! 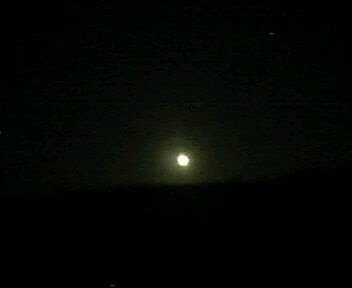 That is my sub-megapixel camera phone’s attempt to take the picture of the full moon. all. When the full moon is low on the horizon, it looks much larger than when it is at its zenith in the sky. I also like the brown tint as well (from our dirty atmosphere). White is so blase! This entry was posted in Phone post on June 3, 2004 by Mark.